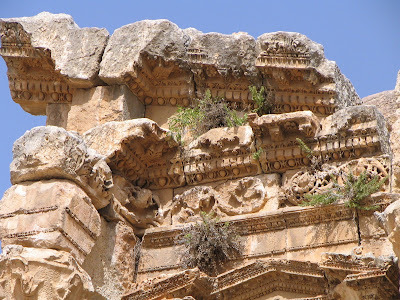 [A rather extended story of my visit to Jordan in May 2007. 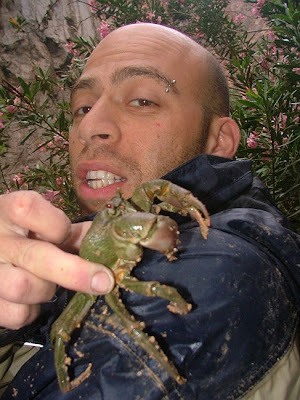 I will attempt to write about my other travels to Scotland, Israel, and Corsica later. 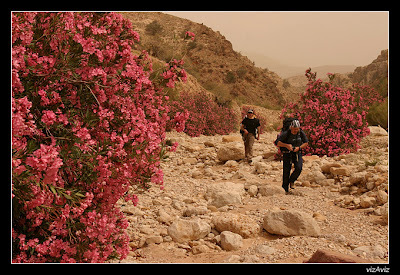 Those who wish to skip onto a particular part of the story, click on: introduction, Jerash and the desert castles, a small canyon and the colorful mountains of Petra, scuba diving, and a thrilling and awe-inspiring canyoning experience. (Note: if you're short on time, the latter three may be of greatest interest to you) ]. Those who frequently read my blog have surely noticed that I delight in nearly every trip and experience that I engage in. Undoubtedly, part of the reason this apparent enjoyment is that I only write about interesting travels and episodes -- I do not feel compelled to write about mundane details of uninteresting days. But it is also part of an innate ability to enjoy and appreciate Life: to come back from almost every hike with a feeling that it's been the best hike I've ever been on, while knowing full well that my next "best hike ever" is awaiting me in the very near future. Still, even keeping my habitual unobjectivity in mind, Jordan was absolutely fabulous! It stands out among my other trips not just because it was the most recent out-of-state one (it actually isn't -- by the time I'm writing this I've already hiked for two remarkable weeks with Katrina in Corsica, and spent most of the summer in Alaska, hiking, kayaking, and playing frisbee), but because of how varied and unexpected everything on that trip was. Before Jordan I have had traveled only in Western Europe, the United States, and Israel: all reasonably civilized, reasonably modernized, and with a mostly white and Christian population. But Jordan was a new frontier. It held surprises of culture, surprises of history, surprises of religion, and, unexpectedly, even surprises from almighty nature. Jordan was not a neat European country with mowed lawns and prices printed on every item in a grocery store: it was a country of rich Islamic traditions and nomadic tendencies, with wild-roaming camels and loud arguing at open-air markets. The above does NOT mean that the country was the very Heart of Darkness -- on the contrary, Jordan has experienced tremendous growth and development over the last 20 years, bringing it closer to the dubiously bright light of the 21st century. Most evident is the country's in-progress transition to living in permanent homes: side-by-side to nomadic tents of questionable sturdiness, held up by little more than Allah's good grace, now rise prominent villas with rich decorations and arched windows. 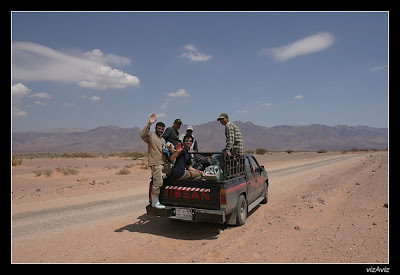 In general, Jordan's tourism is high, while crime is low -- in our experience, nearly all of the locals (of all layers of society, from illiterate fishermen to policemen) were incredibly nice and friendly to us. Jordan is still a third-world country, but it's a third-world-country-plus, closer in development to Israel (which I would label as first-world-minus) then what I would imagine most destitute third-world countries to be. (On a quick side note: it was funny to see how much Jordan tried to emphasize its transition into a modern and touristy country. We saw many signs like "Amman's Modern Pharmacy" or "Modern School of Engineering", all stressing Amman's newfound technological development). 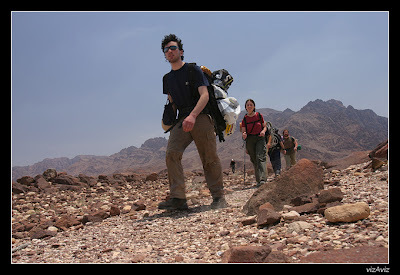 A quick outline: I went to Jordan with my sister Nica, her husband Boris, and their friend Leva, in early May. Our trip lasted just over a week, and on the last three days we were joined by four other friends of Nica and Boris. 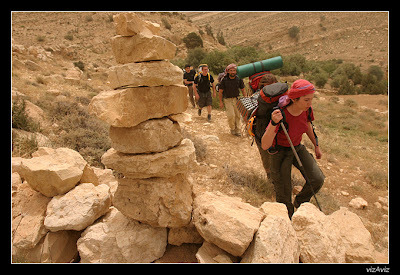 The first five days were spent mostly exploring Jordanian culture and history, while the last three days were dedicated to canyoning in a beautiful valley of Wade Feid. Nica and Boris are both studying to become archeologists, and both are adventurous rock-climbers, trekkers, and outdoors people. This was Boris's fourth trip to Jordan, and he's been nearly everywhere that he led us in Jordan with the exception of the canyon. 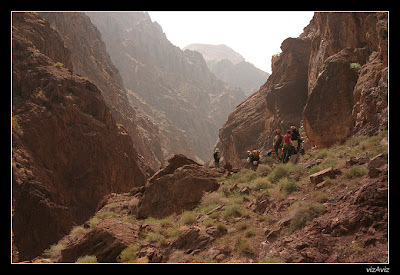 He frequently leads groups of tourists of all levels of experience to various places in Israel and the surrounding countries: in fact, the weekend after we got back from Jordan he took a group of clients to the newly-explored canyon. I highly recommend that anyone who wishes to truly immerse themselves in the Middle East (whether with the intention of an adventurous outdoorsy trip or more of an archeological/historical tour) contact Boris or my sister to find out about their prices and availability -- their contact info is nica123@gmail.com and +972-54-6327789, and they charge quite little for their guiding. Before I plunge into details of the actual trip, allow me to point out some rather general observations about Jordan. As I already mentioned above, Jordan's people were remarkably friendly to us. At first I was a little hesitant to tell native Arabs that I was from America or that our group had just crossed over from the Israeli border, but no one seemed to care. Everyone we ever asked for directions went out of their way to help us, despite the extra time and effort involved with explaining directions in another language. The only people I did not particularly care for were tradesmen at touristy places, each of whom assured us that "he gives us good price", despite obvious indications to the contrary. The people of Jordan seemed religious, at least in outward appearance and clothing. Many had a calm and wise expression upon their faces, endowed with a belief in Allah's greatness and the consequent lack of need to worry about things. Coincidentally, this reduction in worries also translated into a reduction in work ethics -- nearly everywhere we went we saw countless workers taking perpetual cigarette- and coffee-breaks. 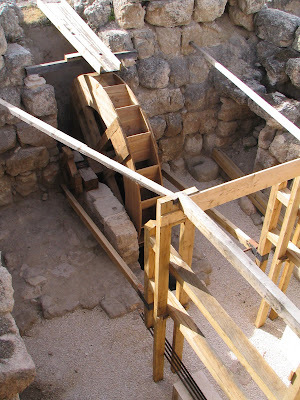 The Jordanian people lived in all sorts of houses, from flimsy tarp-shacks in the desert (surrounded by camels, goats, roosters, and plentiful children), to spacious stone-built homes. Quite interestingly, even the prettiest of homes had ugly cement-and-wire columns sticking out of the top: as my sister explained, those are foundations on rooftops to allow for the future building of additional stories for the family's grown sons. The roads in Jordan were incredibly smooth, wide, and well-maintained, far better than most roads in Alaska! Few roads had speed limits, so we drove a consistent 90-100 mph on the highways. Only when we drove through the cities, either for food or lodging, did we need to slow down. The food in Jordan was very good and cheap at restaurants and bakeries, though I found the Jordanian desserts and candies to be highly odd and relatively untasty. In general, prices at restaurants and hotels were significantly lower than in the United States or in Israel, though the separate "raw materials" for the products (ie: food products, batteries, etc) cost roughly the same as in the U.S.. Presumably, this was because labor costs in Jordan added little to the overall price of a product or service, whereas the US labor costs would typically compromise most of a product's price. One last general note: sad to say, but my fluent American English was very poorly understood in Jordan. My sister's inarticulate English, however -- despite its mixed tenses, heavy Russian accent, and extremely basic vocabulary -- was understood flawlessly. It got to the point that not only did my sister act as a spokesperson for our group, but she even translated my English into the English that Jordanian people could understand!!! We set out from Tel-Aviv, Israel, on a Sunday noon in Leva's car. Three hours later we had arrived at the northern crossing-point of the Israeli-Jordanian border (a second crossing-point located at the southern tip of Israel, near the Red Sea). After tedious security checks and petty fees, which took about an hour to clear, we were finally on our way. In another hour, we reached our first destination, the ancient monumental Roman city of Jerash, currently surrounded by a contrastingly ugly modern Arabic town. Unfortunately, admittance to Jerash had closed just five minutes before our arrival, so we decided to return to it on the following morning, and meanwhile to find some food and lodging in the modern part of Jerash. After drinking a toast to the health of all amiable policemen worldwide, we went to sleep and woke up early on the following morning to be the first visitors to enter Jerash. Doing so proved to be an excellent idea, as we saw nearly no other tourists for the whole two hours of our visit. Jerash is considered to be the best-preserved Roman city outside Italy, and its architecture indeed offered an impressive sight. 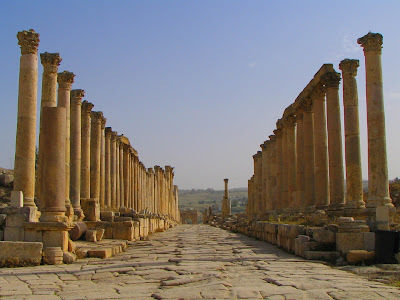 Jerash's huge columns, monumental temples, magnificent streets, fancy stone carvings, and a large amphitheatre -- all nearly untouched by the test of time -- were truly spectacular to behold. But an even more dumbfounding sight (and sound) awaited us within the amphitheatre, where an ARAB, dressed in a KILT, was playing a moderately MUSLIM-sounding melody on a BAGPIPE. After I recovered from my shock at such a phenomenal inter-mixing of cultures, the Arab explained that Britain had once "occupied" (or, in essence, formed) the country of Jordan until its independence in 1946; some British cultural influence, then, has remained behind even in present-day Jordan. For the next two days after visiting Jerash, we drove throughout the area, exploring desert castles. Most of these castles had been built not so much for fortification, but as luxury winter homes for kings and princes some 1,000 years ago. They were of all sizes and designs: the oldest of them had giant stone doors and a roof that was made of long stone blocks laid in a grid-like pattern; another, built with the intention of looking rich without being too expensive to construct, was created out of stone, but covered in easy-to-carve plaster with ornate designs. In addition to the castles, we also visited an interesting bathhouse situated in the middle of the desert. 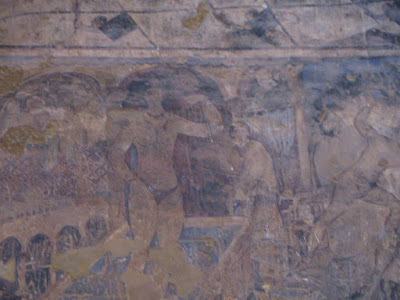 Not only were its mechanisms for drawing and heating water quite intriguing, but the inside of the bathhouse contained colorful frescoes of animals, musicians, and naked women! Apparently the God-fearing Muslims who built the place were not quite as God-fearing as one would think, at least in the modern sense of this word. For while these medieval frescoes flaunted the full nakedness of women in all its beauty, the fully-clothed and head-covered Muslim women who walked about the modern streets of Jordan provided a striking contrast. That disparity became all the more apparent several days later, at a beach on the Red Sea, where the women swam in the very same full-body garments as one would see them walking on the streets in. I suppose I should mention something about the desert. 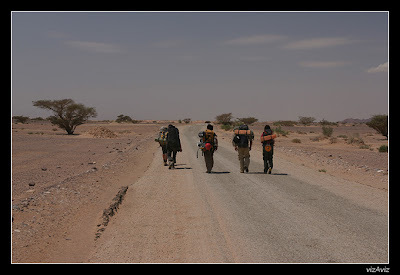 Initially, I found the desert plain and uninteresting, stretching flatly and lifelessly across a littered countryside. 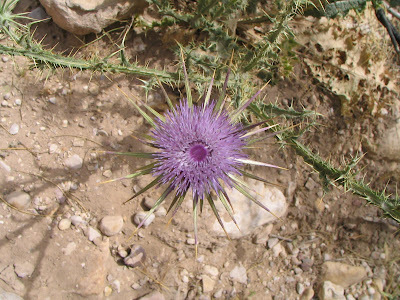 But where the desert rose to form dunes and mountains and canyons, I found the desert to be quite beautiful. 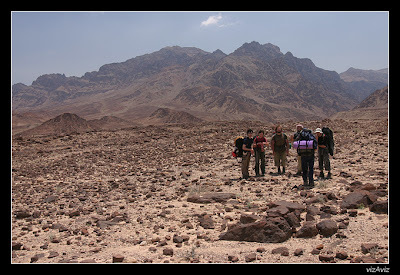 This third dimension not only added perspective and size to the desert, but it also allowed for expanses where water could run and vegetation could grow. In some places, especially in canyons and valleys along the way, the sand and sandstone were composed of multiple colors, ranging from yellow to orange to red. 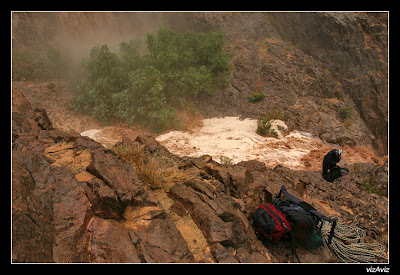 Also, within those valleys, the rain and wind had often blown holes within the sandstone walls, creating picturesque textures. As our two-day desert castle saga was coming to a close, we saw came upon yet another desert castle, perched on a hill right alongside our road. Despite having already seen many castles, and having grown progressively less enchanted by each individual visit, we decided to stop. At first, the castle seemed quite similar to many of the others, halfway in ruins and rather unspectacular. 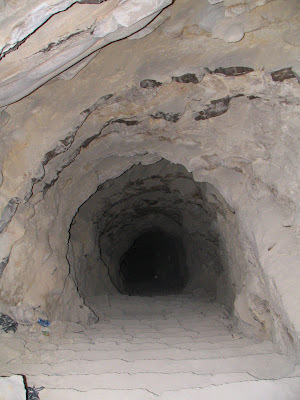 One of its doorways, however, seemed to lead somewhere underground, so we decided to follow it. The stairway soon turned around a corner, out of reach of the sunbeams. We proceeded a little onwards, though still seeing no visible end in sight. Turning on the flash in our cameras, we took a picture and saw that the passage seemed to descend further; beyond that, nothing else could be said about the passage's use or destination. After debating whether or not it was worth it to go back to the car and get a headlamp, Leva finally decided to run back to the car and get his. When he returned, we proceeded to go down by the light of his lamp. The stairs grew more and more slippery and somewhat steeper, but at each turn we thought that the stairway would soon end, leading us into a forgotten cellar. And, with each turn, we were wrong. Absolutely astounded that the stairs kept going for about 10 minutes (! ), we guessed that this I was actually a secret passageway leading to Australia, and that we would soon see hopping kangaroos and bright sunshine on the other end. As we proceeded, we finally saw a dim light flickering in the distance; two minutes later, we came upon a twenty-foot-deep manhole out of which we cautiously climbed. So surprised were we by what we saw, that we nearly fell back into the darkness of our by-then familiar stairwell. Kangaroos or not, the landscape where we emerged looked nothing like where the castle -- and where we ourselves -- had stood 20 minutes before. A valley, an unpaved road, a female shepherd, and some old ruined homes were all that there was in sight. No castle, no highway, no nothing. Based on Leva's high-tech watch, we calculated that we had descended over 500 feet down the unmarked and unexpected tunnel, which presumably had once served as an emergency escape route. Unwilling to climb back the way we came, we determined the castle's location based on the position of the sun, and eventually made our way up the unpaved road towards the unexpectedly surprise-filled castle. 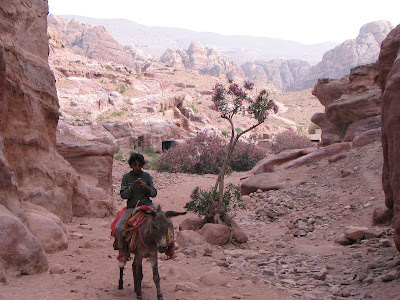 After the desert castles, we spent a day in a small canyon with hot springs (still not the "canyoning canyon" that was to come at the end of our journey), and then another day in Petra. As the two are somewhat thematically connected, I will let the first transition into the second. 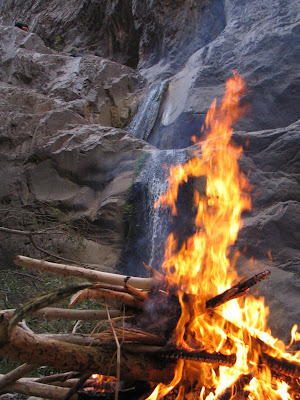 The "small canyon" was fed by two springs: one hot, and one cold. The hot spring had a man-made pool surrounding it, to which we walked on the evening of the same day that we had discovered the mysterious castle. The day had been so warm, that initially I saw no point in going to a hot spring, but the cooler night air convinced me otherwise. Floating on my back in the warm pool, marveling at countless stars glimmering from heaven, I felt completely immersed in nature's kind nurture, and completely at peace with myself and with the Universe. 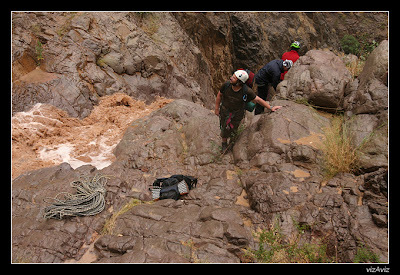 In the morning, we walked for a couple of hours down the canyon, stepping in knee-deep water, but otherwise not needing to do any technical canyoning (real canyoning, with equipment and all, was to come several days later). The canyon was surrounded by colorful sandstone, with its various patterns and designs laid out by Nature's Department of Abstract Art. In parts, the walls were near-vertical or even leaning inwards, with plants and rocks above forming a ceiling over our heads. The main stream in which we walked was of lukewarm temperature, with occasional hot or cold streams joining on the side. Sometimes the water would even join the stream from above us -- in one spot, a series of water droplets kept falling from a tiny creek 100 feet over our heads. The water droplets fell in a regular rhythm, separated enough that each could be viewed individually, but close enough that 10-15 were in the air at any given moment. The resulting image was a classical "free fall acceleration" time-lapse illustration that is so prevalent in physics books, but that I've never before seen so vividly (and without needing to imagine a time lapse) in real life. 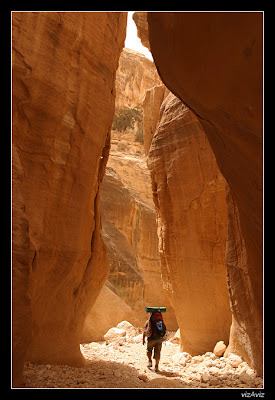 After returning from the canyon, we drove for a while to reach Petra, which we explored all throughout the following day. Petra (which, by the way, had since been included in the "New Seven Wonders" list), is an incredibly touristy but beautiful site of even more colorful mountains and sand, with one important aspect: Petra used to be a town. Because sandstone, by nature, has an unusual number of caves and holes within it, the people of Petra some 2,000 years ago utilized the existing caves for shelter. As time progressed, the people began to decorate the caves' exteriors by chiseling columns and ornate designs out of the mountains. Hundreds of caves were decorated, with many later becoming burial grounds or temples. The result of that touched-up natural beauty is simply marvelous! Beyond the touched-up caves, even the untouched ones were beautiful and full of color. 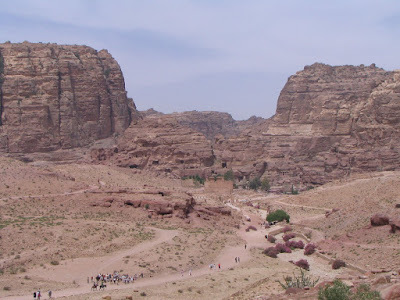 Petra stands at the heart of a mountain range, so when we had seen our fill of caves and temples, we hiked up for a panoramic view of the surrounding region. The views were beautiful, surreal: from Petra, the surrounding land looked like an alien landscape of jagged red rock and sand. In the evening, by the colors of a setting sun, the temples and burials looked even more impressive, adding the pink of the setting sun to the already red and orange rock. The only problem with Petra was how touristy it was: herds of visitors from all countries flooded into the city and crowded the paths, serving as prey to the countless tradesmen scattered along the main road. There were tradesmen of all sorts: gift shop owners, camel drivers, donkey owners (yelling "taxi, 2 dinar"), artists, and others. The only thing they shared in common was a lust for money at the expense of rich European tourists, who would un-bargainingly accept any price. The prices of souvenirs, as expected at such a high-demand place, were several times higher than fair market prices, but even that wouldn't have been a problem if the tradesmen did not so actively try to exploit the tourists. Just one careless glance at a vase or a painting would lead to an enthusiastic speech of "I give you good price", "Only 10 dinar", "8 dinar to start off the day", and etc. Each speech was unwelcome, repetitive, and false -- if someone was just starting off their day at 4pm by selling me a 5-dinar product, their business was definitely in trouble. In one particular instance I accidentally looked at a knife displayed in a nearby stand, and immediately a teenage Arab began telling me of its miraculous qualities, and asking what price I'd pay. I said I didn't need the knife, but he jumped in front of me and told me that usually the knife goes for 50 dinars on the market, but he'd give it to me for 25. I told him I didn't need the knife and walked away, with him walking right behind me and naming progressively lower prices, finally stopping at 5 dinars. When I later thought back on the episode, I was amused at how it must have looked like from an observer's point of view: a frustrated Arab boy, shouting out various sums of money and with a knife at hand, pursuing a white American in a Hawaiian t-shirt amidst a sea of tourists. As we were leaving, some workers were placing and lighting candles along the main path, in preparation for Petra's night visitors. These tourists would be treated to food and storytelling, among other activities. As there was a separate charge for these evening events, however, and as Boris said that the best part of it was the candles we were already seeing (in his opinion, the rest of the show had great potential but lacked glamour in practice), we did not stay for the night program. Still, sauntering through Petra by candlelight was undeniably beautiful, and left us with a lasting mystical impression of the Petra we visited. The following day was most notable for our visit to the Red Sea, where I went scuba-diving for the first time in my life. I dove with a friendly native guide, who was remarkably patient with me and who spoke wonderful English. After I had donned my suit and scuba equipment, we stepped chest-deep in the water onto soft white sand, where he instructed me how to breath, how to relieve pressure in the ears, how to clear the mask, and etc. Breathing was one item that was not as easy as its sounds -- I had great difficulties in breathing normally while on such an artificial-respirator-like device. Several times I tried submerging my head underwater and emerged, panic-stricken, back to the surface. Finally, after several minutes, I mastered my fear and dove in. Scuba diving is probably one of the most breathtaking activities I've ever done. It is more than a sport -- it is a union between the gracious gods of the sea and the lucky diver. Equipped with a tank, mask, fins, weights, and other divine objects, the diver descends into the water, where the sea gods assure him of a safe passage in exchange for a handful of shiny air bubbles. Effortlessly, the diver flicks his fins and water parts in front of him, leading him into the depth of the sea. There, the sea gods show him their untold treasures of colorful fish and spectacular coral reefs. 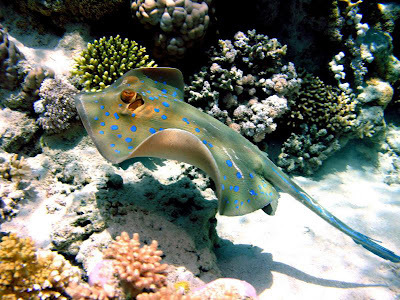 Fish of all shapes and sizes swim by his mask, play hide-and-seek with him behind rocks and corals, perform amazing water acrobatics... Sea hedgehogs, crabs and punk-looking fish with radiantly-colored fins parade about the water, displaying their latest styles and trends. Even the sand and the seaweed are alive 'neath the water, moving to and fro with each rhythmic heartbeat of the sea. It is a wonderful world! But the diver must not outstay his welcome (the precious oxygen in his tank lasts for only about an hour), and so he rises back to the surface, leaving gems of white bubbles along his path. The colorful kingdom of the sea dims, turns gray and sandy, and soon the diver finds himself back on the beach. The water's surface looks plain and devoid of life, with barely a school of colorless plebian fish to break the monotony; only the diver knows of the true wealth of beauty that lies underneath this unembellished facade. And from that moment on, the sea will never feel the same to him, for underneath the glimmers and foam of the water, he'll always feel the sea gods calling him back. I should say that I was very lucky to experience the Red Sea on my first dive: the Red Sea is renowned for its beauty, colorful fish and abundance of corals. If I did not realize how unusual the Red Sea is then, I certainly realized it two weeks later while diving with Katrina in the Mediterranean Sea in Corsica, France. This Mediterranean dive had still been an enjoyable experience, but the gray-green rocks and relatively bleak fish could hardly compare to the lavish display of color and life that I saw in within the Red Sea. To the Mediterranean's credit, I did see some nifty sponges and spectacular seaweed that I had not experienced in Jordan, but the Red Sea still left me in much greater awe. After scuba diving, I swam in the sea some more, joined by my three companions and later by an ever-increasing fleet of jelly fish. The jelly fish were small, purple and relatively non-stinging, but it was still unenjoyable to be touched by them. When we turned to swim back to shore, we found that we had been blockaded by a coalition of the United Jellyfish Front. Bravely taking to the offense and cursing their multitude, we dove under them as best we could, finally making it -- victorious -- back to the shore. We decided to camp at the beach, right by the sea. As we were setting up our tents, an Arab guy in the tent next to us warmly offered us to come join him for fish. Slightly taken aback by such hospitality (the image of the money-grabbing Petra tradesman was still fresh in our memories), we told him that we'd join him after we were done setting up the tents. He walked back to his tent, stayed there for several minutes, and then brought the fish -- along with pita bread with which to eat it -- to us. We offered to make him some tea to return the favor, but when Boris got out a camping stove to start boiling water boiling, he gestured that he had a real teapot in his tent, and that we were more than welcome to come along. Submitting to his invitation, we followed him to his tent: a sturdy, heavy-duty enclosure the size of a room. Outside the tent, on a clean laid-out rug, sat his friends, mostly fellow fishermen. They were watching a Jordanian comedy on TV -- a comedy done so over-the-top that even we could understand it. Our host brought out more chairs, served us tea with the pitas and fish (borrowing lemon juice from a friend in a nearby tent), and did his best to converse with us in English. We, in turn, told him about life in Israel and Alaska, along with our most recent experiences in Jordan. We departed back to our ten only an hour or two later, quite amazed by the kindness and warmth of the Jordanian people towards their Israeli brethren. 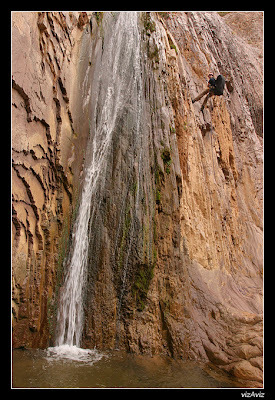 The following day, our last epic journey in Jordan began: the canyoning of Wadi Feid. 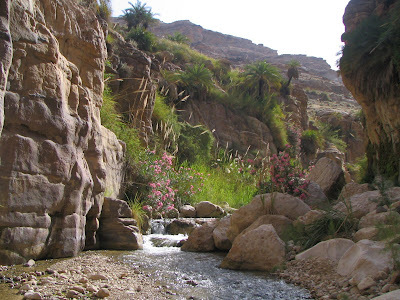 Wadi Feid is a valley carved in the rocks of western Jordan (Wadi means valley in Arabic), with a small creek running through it. 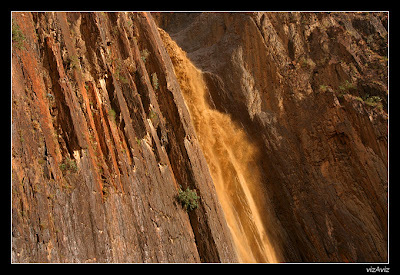 More notable than the creek, however, is a series of eleven waterfalls that pass through the valley, ranging from a mere 20 ft to about 160 ft. 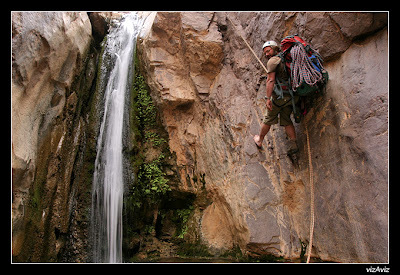 The waterfalls are spread out over the course of several miles, and our goal was to walk from one waterfall to another and rappel (i.e. 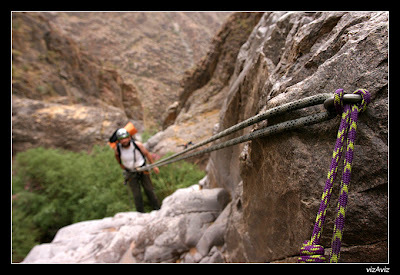 : descend by rope) down through them. 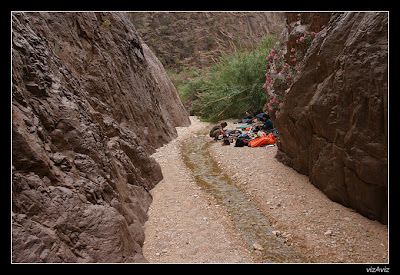 For the crossing of Wadi Feid, we were joined by Nica and Boris's four other adventurous friends: Vitalik, Kostia, Kucher, and Arkadi. 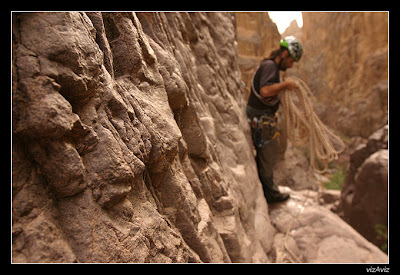 All four were quite experienced climbers, and Kostia was also a professional photographer (all of the upcoming pictures were taken by him -- many more photos and his contact info can be found at http://www.targetpoint.com/greenview/). 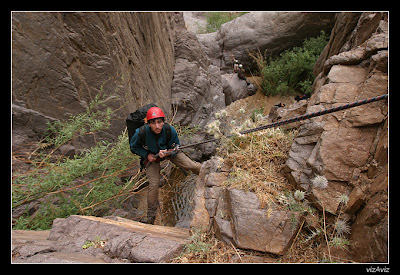 Loaded with rappelling gear, a seemingly endless supply of ropes (including two main 700-ft lines), food, camping gear (we were intending to spend one night in the canyon), and overall bravado, we set out to conquer the canyon and its innocent narrow creek. 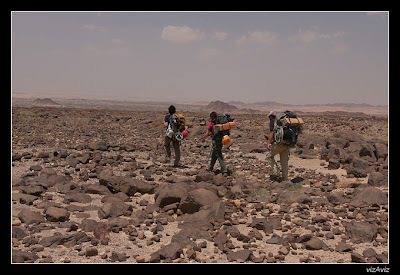 To get to Wadi Feid, we first crossed the rocky but dry surface of another valley, Wadi Shemah, only reaching Wadi Feid by mid-afternoon. 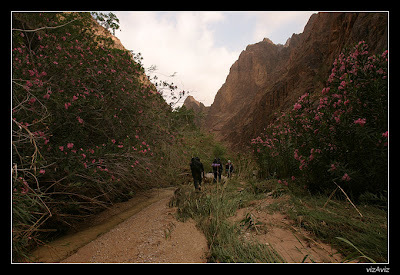 We strolled along Wadi Feid's creek for another quarter of an hour, looking severely over-packed and over-roped, till we finally came upon the first waterfall. 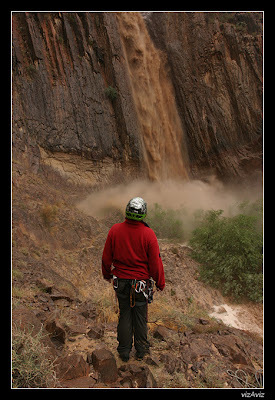 Our true canyoning experience was now about to begin! 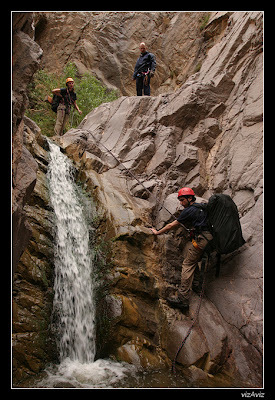 I should say mention that I've never gone canyoning before. With the exception of scaling the man-made walls at a rock-climbing gym twice before, never have I done real rock-climbing, either. 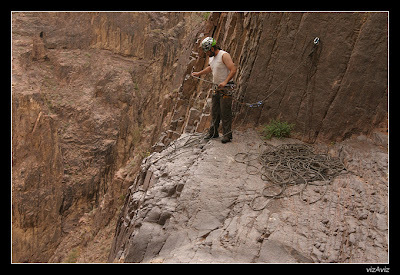 I have done plenty of rock-climber-esque stuff before, but it was always done without gear, outside, on hurtful ground, and hence with a very firm mindset of clinging on to the rocks for dear life (for lack of any rope supporting me). 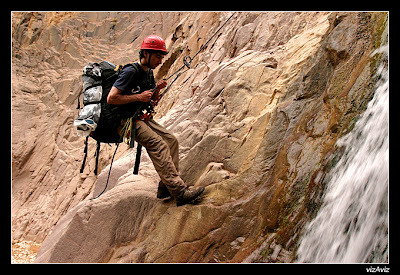 Rappelling is totally different: one must lean back from the safety of a firm grip on the rock's surface, and trust in the flimsy, shaking rope, holding you some 100+ feet above pounding water and rocky spikes; that is, hang by nothing more than thin air and an even thinner piece of twisted fabric. Even the knowledge that the rope is securely attached, that it could easily hold my weight several times over, and that a backup rope is in place did little to ease my qualms. 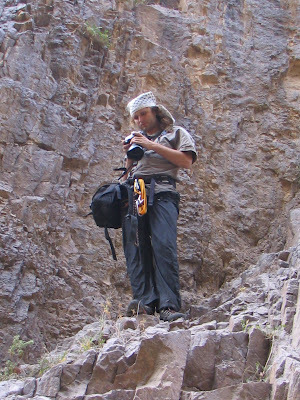 I did my best to keep pace with everyone else and to numb my fears, but I always felt hesitant as I transitioned from standing on a rock's firm surface to leaning back and putting my life at the mercy of a small fabric harness. 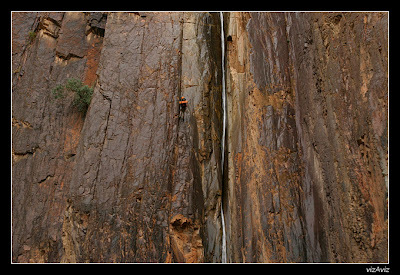 After securing a main rope to the side of the first waterfall, Boris made his way down, easily pushing off of the rock wall and quickly getting to the bottom of the waterfall; he was soon followed by another two or three climbers. 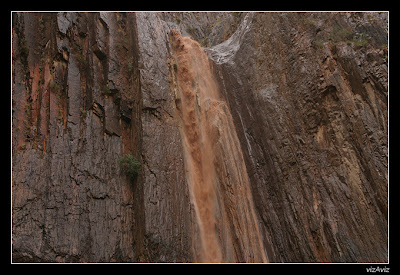 Usually, on hot days, the rope and its occupants would descend among the wet, cool water for a nice refreshing shower; as cold weather had overtaken the typical Jordanian heat in the last several days, however, we tried to avoid getting directly underneath the chilly waterfalls for the duration of the trip. Meanwhile, as the first several climbers descended, Nica and Leva taught me a quick crash course on… not crashing. The basics were simple enough: Nica would tie me on to the main rope, and I would simply push with my feet against the rock (see lamentations above), and slowly let the rope pass through my right hand while sliding another knot down with my left hand. 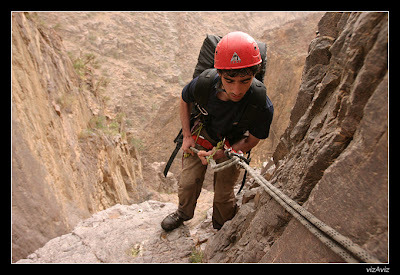 The right hand, which controlled the speed of the descent, was to ALWAYS remain on the rope (not easily done at times, such as when I bumped my elbow on a jutting rock). The knot that I was to slide down the main rope with my left hand was a backup device: much like a car's seatbelt, the knot would loosely slide along the rope at a slow speed, but would hopefully lock up during a sudden jerk. With a quickened pulse but a sluggish pace, I finally made my way down the first, 30-ft, waterfall. 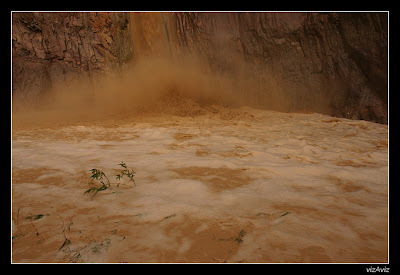 Much like the rest of the waterfalls, it was surrounded by firm, barren, near-vertical, light-colored rock, made somewhat slippery by the presence of continuous water spray. I almost injured myself on a second waterfall, about the same size, but fortunately Nica and Leva noticed that there was slack in my rope, and helped me amend it. Evening was setting in by this point, so we made a fire, cooked food, told tales, and prepared for sleep in the canyon, right next to the water. A light rain sprinkled for several minutes early at night, and our proximity to the water would have become potentially dangerous if actual rain fell and the water level rose, but the drizzle had fortunately stopped soon thereafter. 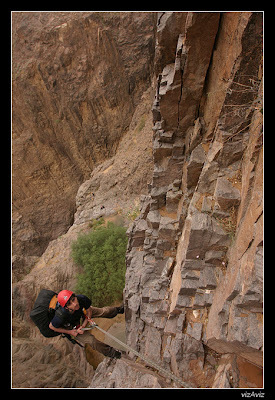 After a safe night's sleep, we continued our descent through the canyon. 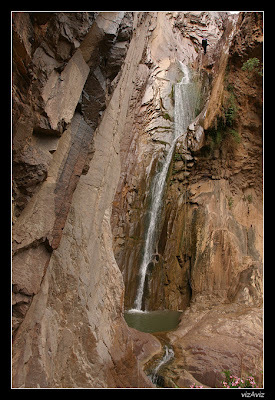 The waterfalls got progressively taller and more difficult as we went -- soon I found myself facing a daunting 100-ft drop that curved out of sight, and that forced me to cross right through the splashing creek, drenching and blinding me as I stood underneath it. An hour or two later I descended down an even taller, 140-ft, waterfall, from the top of which my companions below looked like hunched backpack-carrying ants. The day had turned out cold and drizzly, to the point that my fingers -- especially when clinging on to a wet rope, with water mist splashing upon me -- felt so numb that they could barely keep a firm grip on the rope (an uneasy feeling at 70-80 ft above ground, to say the least). To speed up the process of descending, and to spend less time shivering while waiting for the climbers before us, we were now utilizing both main ropes on two waterfalls at a time: the first climber to descend down the first waterfall would immediately start tying a rope onto the second one, while the rest of the group would slowly join him and continue to descend down the second waterfall. For several short bursts throughout the day, the sprinkling rain turned into a true downpour, but it always returned to an innocent drizzle several minutes later. Then, contrary to the pleasant forecast of partly-cloudy weather, the rain unexpectedly picked up again and did not wish to stop. We had, at that moment, reached the most climactic part of our trip – rapelling down the two last and tallest 170-ft waterfalls. 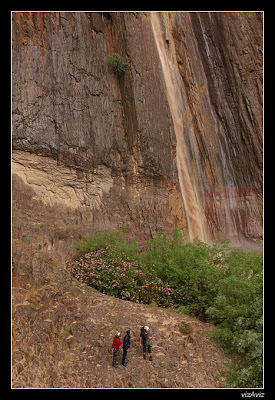 Most of us had already descended from the first waterfall, and were standing on a little plateau some 200 yards away, with the second waterfall at our feet. Two guys had already made it down the second waterfall, and my sister had just begun descending towards them when the rain started pounding upon us with newfound force; Leva, the last person remaining at the first waterfall, had likewise just commenced his descent. It should be noted that the desert hardly absorbs rain; most of it rolls off the sand and down into valleys. 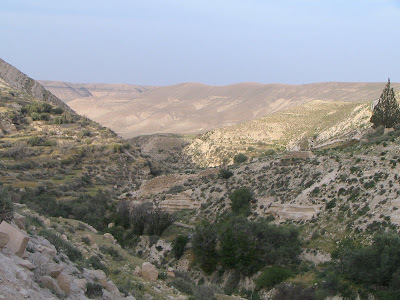 For that particular area of Jordan, the valley chosen as collection point for all nearby off-flows conveniently turned out to be Wadi Feid -- our canyon. So when the drizzle, bypassing a rather critical threshold, turned into a downpour, our little creek, bypassing a medium size, became a roaring, turbulent stream. 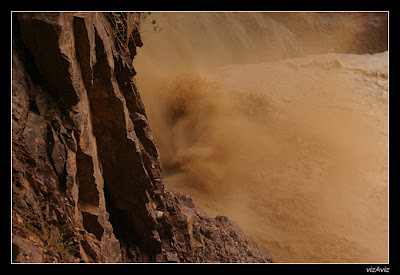 Leva and Nica had just barely made it out of their respective waterfalls when the water took on a distinctive shade of brown; within minutes, the rushing water had become intertwined with hefty rocks. 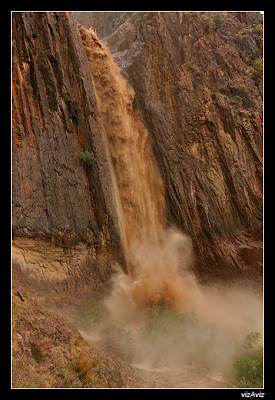 With rumbling screeches, the rocks fell off the walls of the waterfall, bouncing back into the water and crashing into a violent lake that formed at the bottom. From the mountains all around us, many a stone began rolling down the steep slopes, crashing into the ground with thunderous blasts. There was no question of continuing the descent down to where Nica and the two guys were -- in fact, we barely managed to pull the rope out of the way of the expanding stream. We gestured to them to get onto higher ground and wait for the flood to settle. All we could do for now was cling onto our patch of high ground, gaze in awe at nature's unpredictable burst of wrath, and hope to come out of this unexpected peril alive and uninjured. And awe it was. Imagine a train, coming out of a sharp corner at full speed, and then falling -- falling -- falling nearly 200 ft into a lake. The water parts with the incoming blow, rushes to the side, and then shoots 50 feet back up in the air. Short trees, standing on what was once the bank of a small pond, and now covered in several feet of water in a raging lake, bow down like grass as this second impact of the water crushes upon them. Hardly do they straighten back up when another pulse from another "train" of water crashes into the lake, once again sending the trees into a reverend bow. And again, and again, and again... non-stop for two hours, as Allah's rage passed through our canyon. A word about Kostia, our photographer. He had impressed me much earlier on: for his bravery, calm, willingness to extend a helping hand, and the unmatched skill and ease with which he jumped from one rock to the next, clinging on to slippery surfaces as if his shoes were coated in industrial-strength Velcro. Now, during the flood, his ability to grip onto rocks was all the more astounding: with a camera in hand, not taking his eyes off of the viewfinder or his hand from the shutter, he would leap blindly from one rock to the next, in search of a perfect angle for his shots. Guided by what seemed like intuition alone, he landed flawlessly time and time again, taking row after row of spectacular pictures. With scrupulous dedication, ignoring the mist, the cold, and the flying stones, he remained by his hard-clicking camera for the whole duration of the spectacular flood. I should note that we were quite lucky that the flood caught us in a place where we could easily scramble to safety. Our "top" group had a great (though not rain-proof) plateau to rest on, far above the water; the "bottom" group was less comfortable, but still out of imminent danger. 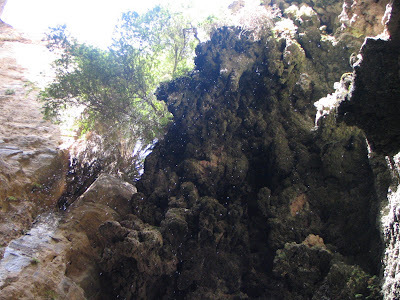 They were able to retreat to a large rock jutting out from the side of the canyon, and, though the water level kept creeping up to their hideaway, they still had a few feet to spare when the water level began dropping. Their comfort was somewhat curbed by the fact that most of the water mist sprayed full-force onto their sanctuary, that rocks kept flying at their sides, and that, as they huddled together on the crowded rock, they were joined by all sorts of shelter-seeking creatures of the Earth -- snakes, crabs, spiders... Based on my sister's account, they felt quite like on Noah's ark :-) But, again, at least we all were reasonably safe. 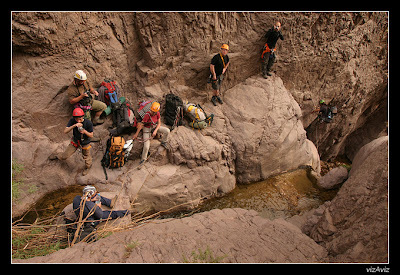 A group of climbers less than a hundred miles west of us, stuck in a similar canyon, could find no retreat; they were found dead several days later. By the time the flood had partially subsided, afternoon had turned to early evening, and Boris decided to attempt reuniting with our stranded companions below. He would descend first, and then gesture to us if it was safe to follow. 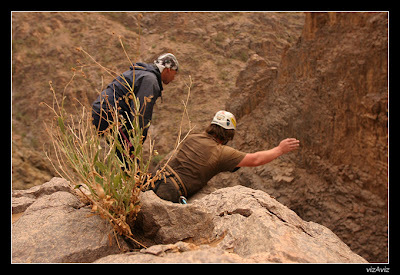 After we agreed on a system of signaling (shouting was of no use against the roar of the water -- instead, we used one arm gesture for "yes" and another for "no"), Boris re-tied the rope and began his descent. Upon reaching the ground, however, Boris became hindered by a seemingly uncrossable lake that had expanded vastly underneath the waterfall during the flood. After exerting hour-long painstaking efforts to cross it, Boris finally conquered the lake and signaled for us to proceed; but, hardly had Leva fastened himself onto the main rope, when the rain picked up again, the roar of the waterfall increased dramatically, and Boris's conquered lake once again became engulfed in a spray of water and rocks. A long signaling dialogue ensued, during which it became abundantly clear that a language of just "yes" and "no" signals is hardly enough to maintain a robust conversation. We gestured to the waterfall, pointed "no", and tried to understand the strange signals that Boris was trying to convey, made all the more obscure by the enclosing darkness. In desperation, Boris finally dug out his flashlight and proceeded to spell out some mysterious letters, symbols, or signals, but to no avail. Finally, with the help of a second flashlight, Boris managed to convey a straightforward "no". At last something coherent! We fumbled around for our flashlights, repeated the "no" signal back to him and, satisfied with our mutual understanding and our unparalleled communication abilities, prepared for sleep. Funnily enough, despite an even distribution of four-and-four adventurers, our groups turned out to have a remarkably uneven distribution of gear, let alone of sleeping conditions. When we had packed in the morning, we could not have guessed that we would get split up, and so many of us carried each other's gears. Thus, the "top" group, with Leva, Kostia, Vitalik, and I, ended up with both sets of cooking stoves, nearly all the food, an extra sleeping bag, and a reasonably dry patch of high ground; the bottom group ended up with a deficit of everything but cold mist, bedfellow-snakes, and countless bottles of alcohol! The following morning, hardly a trace was left from the previous day's flood. The sky had transformed into a bright, cloudless blue, and the small creek bubbled innocently with perfectly clear, mud-less waters. Without any difficulties we climbed down to re-join the bottom group (who were boiling the last of their coffee supplies on an open fire) and proceeded to walk down the canyon. Within several miles, and without any further waterfall descents, the canyon opened up into a wide valley, the creek retreated underground, and our path led us into the flat desert. Within another couple of miles, a sad truth dawned upon us -- we were in the middle of nowhere, an arbitrary number of miles away from the main road, on a scorching, cloudless day, and with almost no water. The rain that we had so vehemently cursed yesterday would have been a blessing today! 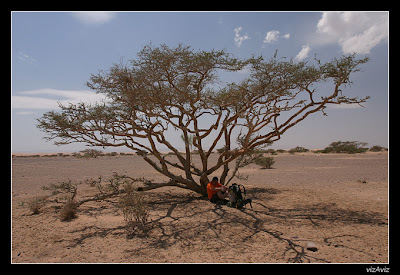 Exhausted, we sat underneath a solitary tree and began to consider our options. According to a moderately confused map, a little town lay five miles west of us. Unfortunately, the desert in that direction was sandy and impenetrable; a much easier route would be to walk around the sand at the expense of another 2-3 miles. As Boris and Kostia debated which route to take, and the rest of us looked gloomily at our near-empty water bottles, a mirage of a black car sped past us, some 200 yards beyond our tree. In disbelief, we jumped up in the direction of the car, and immediately came out to a beautifully paved road that corresponded to absolutely nothing on the map. We walked the road for a bit till we came to another lone tree, sat underneath it, whipped out a cell phone, prayed for reception, and successfully called a taxi. 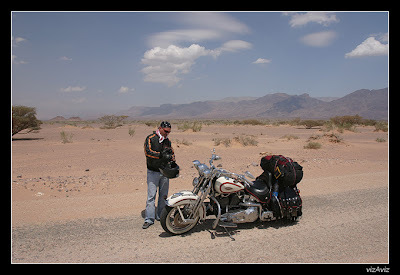 As we waited, the lifeless desert erupted with another loud roar of engines, and soon we saw a number of motorcyclists heading on the road towards us. 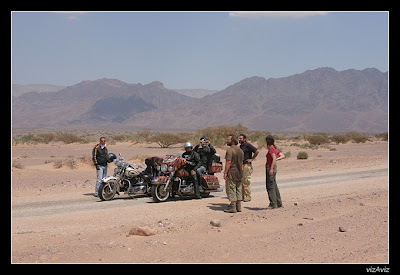 Dressed in black leather, on shining new Harley-Davidsons, they probably looked as out of place to us as we -- loaded with backpacks and rappelling gear in the middle of a flat desert -- did to them. We stopped one of them to ask what road we were on, and he explained to us that we were indeed not on the main road, but rather on a small local road that connected this area to another village. 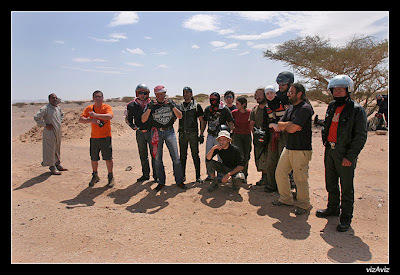 The remaining motorcyclists asked us who we were, and we replied that we were Israeli adventurers who had just canyoned Wadi Feid; they, in turn, told us that they were rich Lebanese thrill-seekers, out for a ride in Jordan. Despite the recent disputes between these respective nations, the Lebanese were quite nice to us, offering cigarettes, shaking our hands, and wanting a picture with us. When another car passed by us, and my sister tried to negotiate a ride back to Leva's vehicle, one of the Lebanese motorcyclists helped us as an English-to-Arabic translator. Our ride secured, we parted with our new Lebanese friends and headed back to where we had parked Leva's car, right as a taxi appeared to pick up the rest of our group. We left Jordan on the following morning, with some incredible memories from this fascinating and mysterious land.